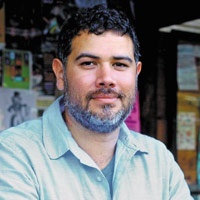 Come see our upcoming contest judge, Manuel Gonzales, reading from The Miniature Wife and Other Stories at the AWP 2014 Conference. Manuel will read on Saturday, March 1st at the Washington State Convention Center, Level 6 for the event “Celebrating 20 Years of Extraordinary Fiction at Riverhead Books.” The readings go from 1:30 pm to 2:45 pm. In addition to Manuel’s reading, you’ll hear recent work from Jess Row (author of Nobody Ever Gets Lost), Danielle Evans (author of Before Your Suffocate Your Own Fool Self), and Nami Mun (author of Miles from Nowhere).